• Josh 1:2 & 10-11 - God promised Joshua they would cross the Jordan, but He didn't give him a plan on how to do it. • In faith, Joshua began to move. • He was focused on the PERSON of God being faithful to deliver on His PROMISE, even though He didn't have a PLAN. • They got to the Jordan and camped - they didn't cross. Why? • Because he did not yet know God's plan. 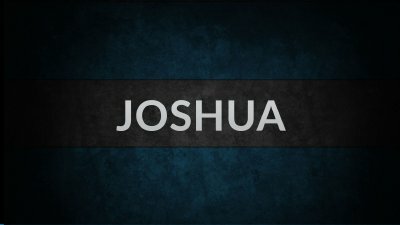 • Joshua told the priests to lead the way. Why? • Because he knew how God had led them in the past under Moses. • On the third day they started moving, and then God gave the plan! • Lesson (actively waiting): • 1) We need to move forward in faith when God speaks. • 2) We need to go at His pace. • 3) We need to let God lead us. • 4) We need to be ready for His plan in His time.